Bariatric surgery offers the only effective long-term weight loss therapy for morbidly obese patients. 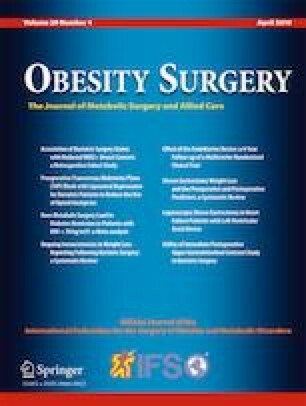 Numerous studies have demonstrated a mortality and morbidity reduction associated with weight loss surgery, but these interventions also have significant rates of complications. It is important for the bariatric surgeons to recognize these complications and acknowledge which of them can be solved in a minimally invasive manner in order to offer to patients the best treatment. The aim of this article was to review factors and success rates associated with percutaneous image guide abdominal interventions to treat the complications of bariatric surgery. Retrospective descriptive study. Eighty-two patients with complications after bariatric surgery were included. Of these, 56 presented fistula with or without abdominal collection. Of the total patients, 54% are male and 46% female. The average age was 49.4 (range 16–62). Of the 56 cases, 37 (66.1%) occurred after laparoscopic sleeve gastrectomy, and 19 (33.9%) post-Roux-en-Y gastric bypass. The fistula was resolved by percutaneous image guide abdominal interventions in 49 opportunities, of which 67% required only conservative treatment afterwards, the remaining 33% required endoscopic treatment with prostheses, fibrin sealants, and/or clips. No mortality was reported in the series. Percutaneous image-guided abdominal interventions play a significant role in the treatment of complications following bariatric surgery. The minimally invasive treatment of fistula after bariatric surgery is safe and effective.